Home > Local Reviews - Places, Activities and Events > Victoria Park Putt Putt and So Much More! Victoria Park Putt Putt and So Much More! 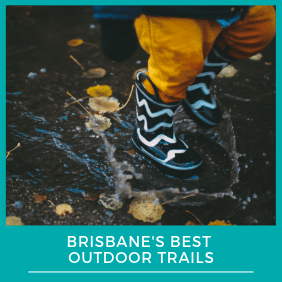 Next time you are looking for a family fun day out in Brisbane that offers up something for everyone, we suggest you look no further than the inner-city suburb of Herston, home to the Victoria Park Golf Complex. 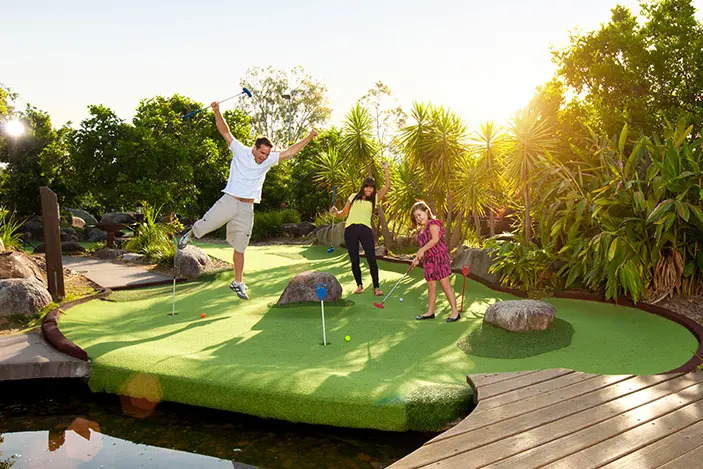 With putt putt mini golf, an adventure playground, oversized games, and jumping castles being just some of the delights to be found, the complex’s slogan of ‘the fun starts here‘ could not be any more accurate. This is a review of a day with kids at Victoria Park Golf Complex. 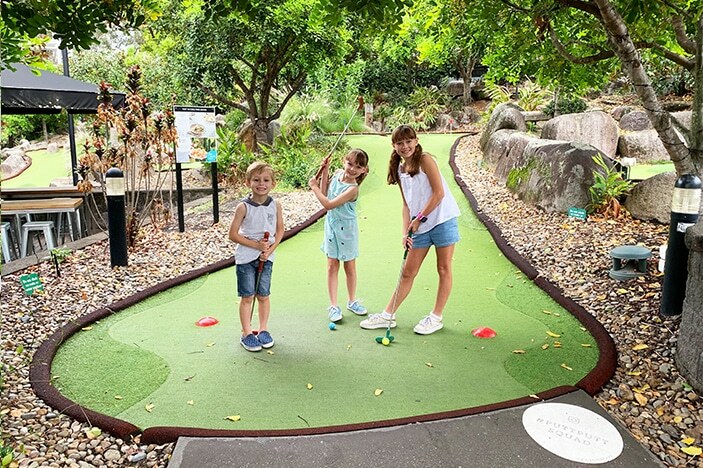 The Victoria Park Golf Complex is home to an impressive adult-sized golf course, however it is the quirky putt putt green that is the major drawcard for families, with many children (and adults) eager to test their hand at the beautifully laid-out course. Spread generously over multiple tree-lined levels, the 18-hole course winds up and around the grounds, over rocky terrain, and around tranquil water features. At one stage you even cross over a bridge to get to the final three holes on an elevated level of grounding. From before the very first hole, my children took great delight in being able to select their favourite coloured ball and child-sized club each. And then the real fun began! Challenges for kids young and old..
Each stage of the course comes with three different coloured flagged holes that you can aim for, depending on your level of expertise (or confidence). 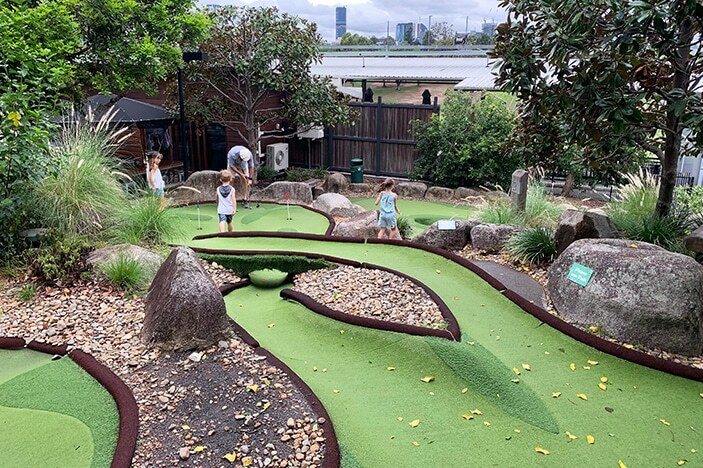 The idea is to then focus on your coloured flag at each hole throughout the course (or, in our family’s case, aim for one but then exclaim loudly you were going for another when your ball accidentally goes off course and sinks into unexpected success!). 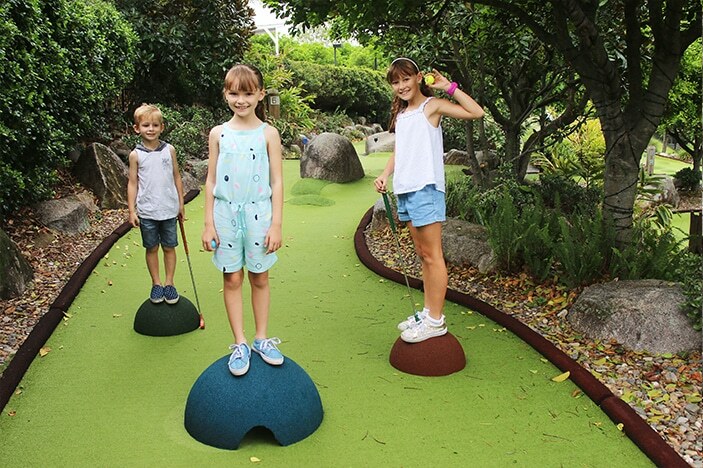 The putt putt course itself is peppered with small and large challenges that my kids enjoyed analysing before then testing out their different methods in an effort to sink their ball in as few a hits as possible. The ripples of joy, devastation and laughter echoed throughout the course and I suddenly appreciated why Victoria Park Complex mini golf is so popular with families of all ages—it’s so much fun! For my family, the course entailed an hour and a half of tested patience and skill (adults), possibly some light cheating (kids), a hint of competitive fun (adults again) and a whole lot of entertainment. The scorecard at the end may have read more like a game of ten pin bowling than golf, but we definitely all came away feeling like we could hit the pro circuit any day now. 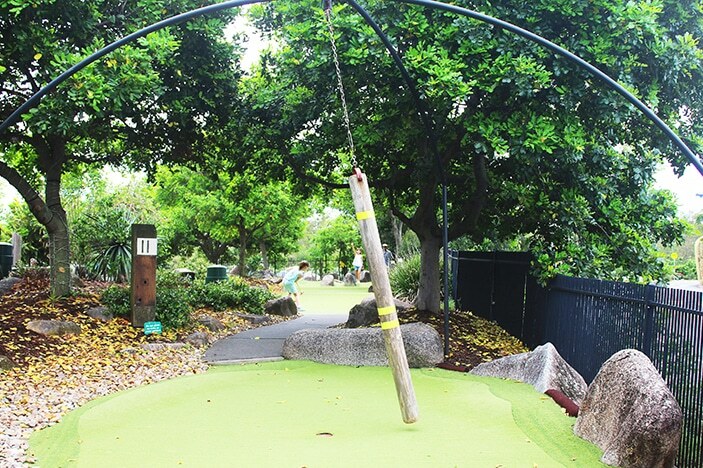 The Victoria Park Golf Complex putt putt course is a popular location for kids’ parties. If you bring 10 kids or more, you will qualify for one of their great party catering packages. Find out more about parties at Victoria Park here. Putt Putt is open until late every night; Sunday – Thursday until 10 pm and Fridays and Saturdays until 11 pm. You don’t need to book – just turn up! 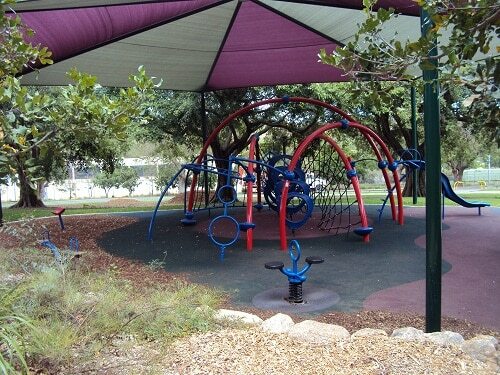 The grounds at Victoria Park Golf Complex are also home to an array of other facilities created for little people to discover and explore. 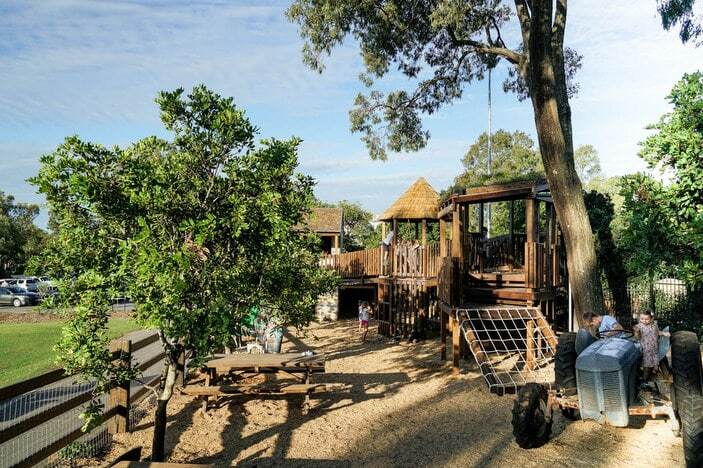 The adventure playground consists of a beautiful, large, wooden cubby house that boasts a slide, climbing ropes, rock climbing wall and multiple imaginary play areas. 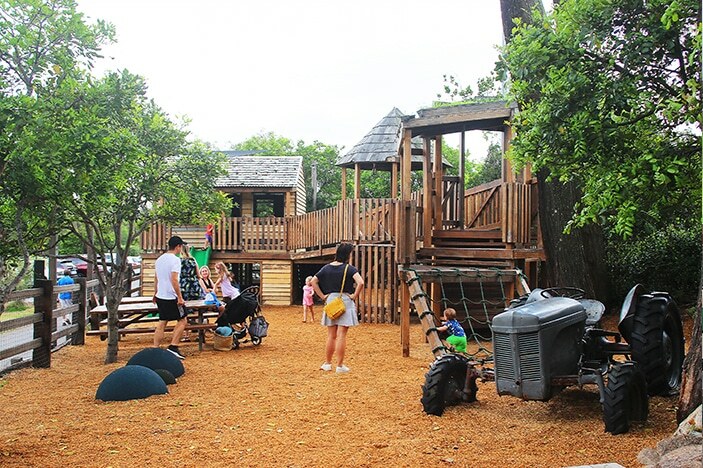 Suitable for both younger and older children, your kids will enjoy spending time on the re-purposed farm tractor and in the rowboat and play kitchen. Levers and buckets on ropes that lead from one level of the cubby will be a hit for those kids seeking more of a challenge. The playground is also nice and open, making it easy for parents to relax on the benches nearby with a drink while their children play. For my children, it was a case of no matter where they turned there was something new to be found at Victoria Park. 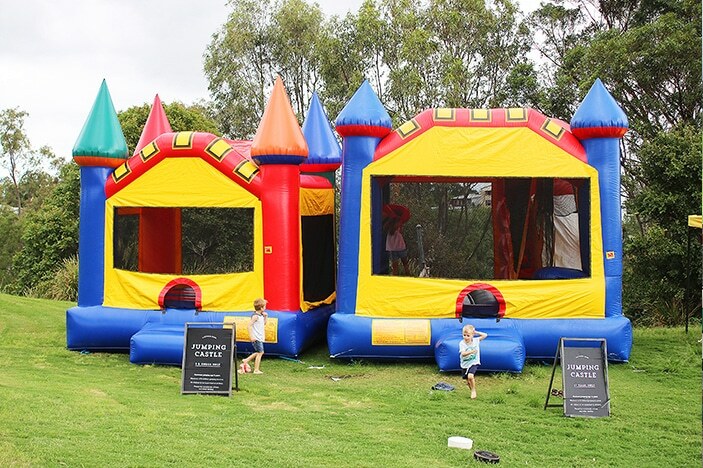 The undulating green lawns in front of the bistro were not only framed by spectacular city views but home to a couple of large jumping castles (one for under 5’s and one for 5+ years), as well as a selection of oversized lawn games. Bocce, chess and badminton were all on offer and, even with all this competing for their attention, there were also the grassy hills to roll down – an activity that all children (and adults) should partake in and which my children focused much of their energy on. 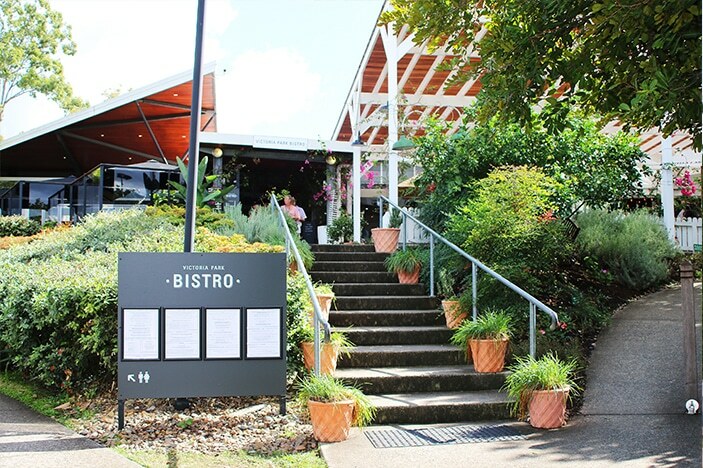 The Victoria Park Bistro is a large, sprawling restaurant with multiple dining areas and it is not unusual to see its wide open decks overflowing with happy patrons; from business people to families. You can look forward to a menu that includes wood-fired pizzas, BBQ glazed pork ribs, arancini balls, and grain fed beef burgers, as well as an array of drinks and desserts. They also serve amazing coffee. 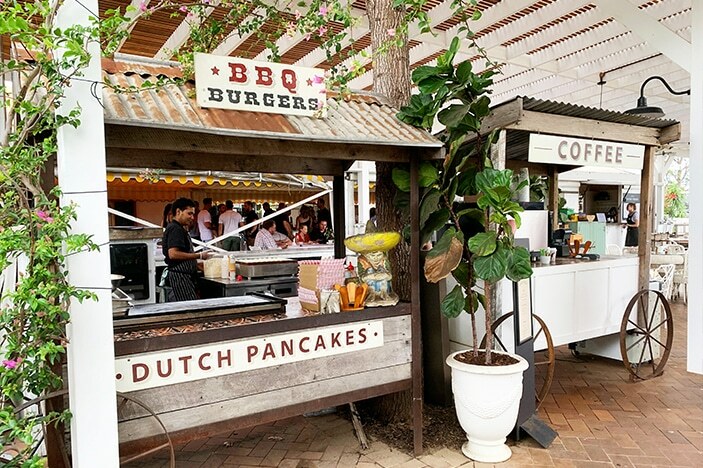 On weekends, guests can also enjoy fresh Dutch pancakes, burgers, German sausages and drinks, all served from Victoria Park’s weekend market carts. Victoria Park offers a wonderful kids’ menu, with multiple options and large portions that can easily be shared out amongst the smallest members. To ensure that families can relax and enjoy their meal at leisure, the Bistro also provides yet more play items for kids, including giant games of Jenga, Connect Four and a magnetised wall Scrabble board. Surprisingly, after a full day of putt putt, playground fun, castle-jumping and hill-rolling, our kids were more than happy just to sit at the table and relax by the time we finally hit the Bistro. This didn’t stop them devouring two woodfired pizzas, a bowl of chips and over 20 mouthwatering dutch pancakes between them though! 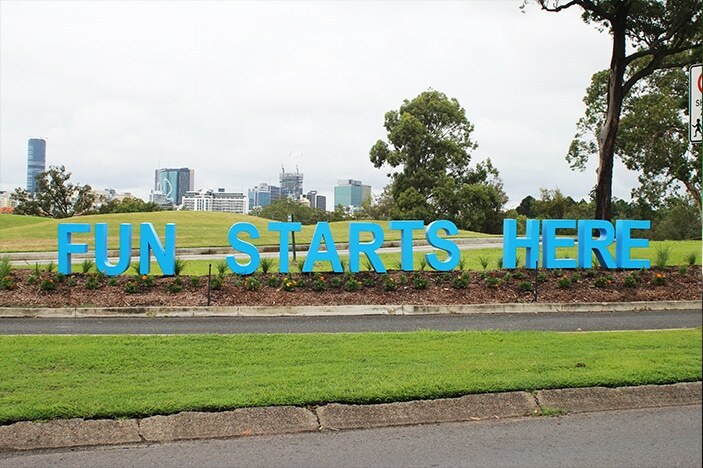 Victoria Park really is overflowing with family experiences, activities, adventure and fun. Whether it is through some friendly competition on the putt putt course, discovering and sampling from their multiple fruit trees and herb gardens (be sure to look out for these! ), relaxing out on their deck, playing oversized lawn games, or simply rolling down grassy hills, a day spent here is a day spent creating unforgettable memories for the whole family. My children didn’t notice the driving range at the entrance of the putt putt course when they first went by, however at the end when we went to return our clubs they most certainly did. They were completely spellbound by the impressive swings, loud smacking sounds and white balls that floated to become tiny specks in the distance. The facility boasts a 300m all-weather, two level, floodlit golf driving range, including 53 hitting bays and a grass hitting tee, plus 4 target greens. Although they may not be able to hit it as far as the experts, for less than $20 for a bucket of balls and club hire families can have a lot of fun trying.